The 25th child of a wool dyer in northern Italy, St. Catherine started having mystical experiences when she was only 6, seeing guardian angels as clearly as the people they protected. 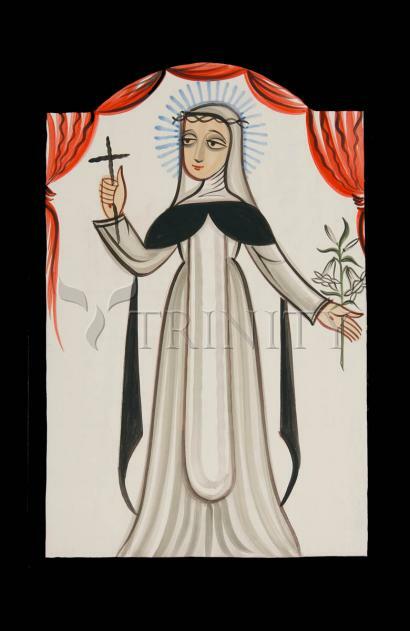 She became a Dominican tertiary when she was 16, and continued to have visions of Christ, Mary, and the saints. St. Catherine was one of the most brilliant theological minds of her day, although she never had any formal education. She persuaded the Pope to go back to Rome from Avignon, in 1377, and when she died she was endeavoring to heal the Great Western Schism. In 1375 Our Lord give her the Stigmata, which was visible only after her death. Her spiritual director was Blessed Raymond of Capua. St. Catherine's letters, and a treatise called "a dialogue" are considered among the most brilliant writings in the history of the Catholic Church. She died when she was only 33, and her body was found incorrupt in 1430. Catherine was the youngest child in a large family. At the age of 6 she had a vision in which Jesus appeared and blessed her. Her parents wanted her to marry, but she became a Dominicantertiary. She was a mystic and a stigmatist. Catherine received a vision in which she was in a mystical marriage with Christ, and the Infant Christ presented her with a wedding ring. She was counselor to Pope Gregory XI and Pope Urban VI. Catherine was proclaimed Doctor of the Church on October 4, 1970.